Make plans to tune in for one, or all, of these favorite and new holiday programs from NPR, Public Radio International, and American Public Media. A perennial NPR favorite with all new Hanukkah stories. Hosted by Susan Stamberg and Murray Horwitz. This hour-long Chanukah favorite returns: A celebration by The Western Wind performing Ladino songs of Spanish Jews, Yiddish melodies of Eastern Europe and modern Israeli tunes. Mindy Ratner hosts a new edition of this holiday favorite, in celebration of Chanukah, the Jewish Festival of Lights. Candles Burning Brightly explores Chanukah foods and traditional activities - and plenty of music. Korva Coleman hosts one of the great holiday traditions in America: the choirs of Morehouse and Spelman Colleges -- two of the most prestigious historically black institutions in the nation -- get together to present a spine-tingling concert program. This encore presentation features the best works of the last several years. It's a joyous celebration of the schools' tradition of singing excellence, with their trademark mixture of spirituals and carols. Handel's much adored oratorio, Messiah, returns to Heinz Hall. Led by Music Director Manfred Honeck and featuring a cast of guest vocalists and the Mendelssohn Choir of Pittsburgh, this work is a religious story of hope, inspiration, and timeless expression. Celebrate the return of the sun with an encore performance recorded in the world’s largest Gothic cathedral. Musicians include gospel singer Theresa Thomason, multi-instrumentalist and singer Arto Tunçboyacıyan and double reed wizard Paul McCandless. Hear the American Performance Premiere of the Grammy-winning suite MIHO with The Paul Winter Consort: Eugene Friesen, Paul Sullivan, Eliot Wadopian, Jamey Haddad, Tim Brumfield, and the thundering Cathedral Pipe Organ. WNYC's John Schaefer hosts. Hosted by Michael Barone, this is a live service of spoken-word and music (choral and organ) broadcast from the chapel of King's College in Cambridge, England. The 30-voice King's College Choir performs the legendary Festival of Nine Lessons and Carols service of Biblical readings and music. Lynne Warfel hosts an hour of gorgeous, contemplative choral music that tells the traditional Christmas story with songs about angels, the star, and the manger scene. Featured artists include Cantus, Chanticleer, Cambridge Singers, Bryn Terfel, Emma Kirkby, Jessye Norman, and a variety of choirs. Host Scott Blankenship reviews his favorite carols this holiday season. You will love singing along as he shares his top picks for the Christmas season, performed by today's leading artists and ensembles. A service in song and word that has become one of the nation's most cherished holiday celebrations. Tickets to the event - which takes place at St. Olaf College in Northfield, MN - are always gone months in advance. The festival includes hymns, carols, choral works, as well as orchestral selections celebrating the Nativity and features more than 500 student musicians in five choirs and the St. Olaf Orchestra. This one-hour celebration in story and song is public radio's only nationally-syndicated Kwanzaa program. Hosted for 23 years by acclaimed storyteller Madafo Lloyd Wilson, this annual special captures the tales and traditions of African American and African peoples. This perennial Christmas favorite is from VocalEssence, one of the world's premiere choral groups, led by Philip Brunelle. 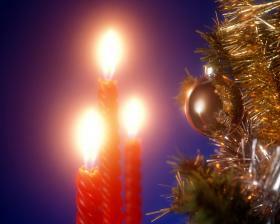 Join host John Birge for an hour of traditional carols and new discoveries. A one-hour program of holiday favorites, new and old, presented live in concert by the superb 12-man ensemble known as "an orchestra of voices." If only the Capitol Steps had some funny material to work with in 2018...is something that will never cross your mind when listening to their Year In Review New Year's special. The Vienna Philharmonic presents its ever-popular annual New Year's Day concert from the Golden Hall of the Musikverein in Vienna. You'll hear your favorite waltzes, polkas, and more -- a festive way to start off the New Year. Presented by NPR Music.